Some terms we use in the automotive lexicon are absolute. Others are relative. Take "subtle" for example. Most wouldn't call painting a car bright red "subtle", but when you compare it to the last rally-edition Skoda Fabia we reported on, that's exactly what this is. Whereas the S2000 edition Fabia vRS sported full livery taken from the company's IRC-winning S2000 Fabia, this one's decidedly more low-key, but not without its dose of flair. The Monte Carlo edition celebrates 100 years of the namesake rally - and 110 years of Skoda's motorsport program - with a red and black paint scheme. While the body is painted bright red, everything else has been blacked out, from the roof to the 17" alloys, including the mirror housings, grille and smoked headlamps. The red and black theme continues inside with either black or red and black seats, complemented by black roofliner, and color-keyed steering wheel, shifter and handbrake lever. Based on the SE specification and available with a range of engines from 1.2 to 1.6 liters, the Fabia Monte Carlo will make its debut at the Monegasque rally later this month. Details after the jump with photos in the gallery below. 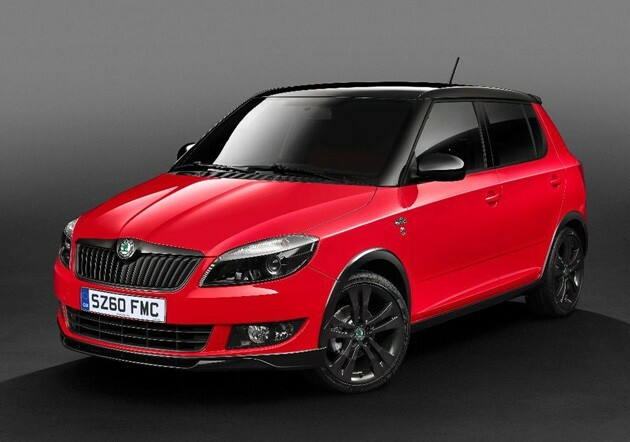 Skoda rallies to the cause with Monte Carlo edition Fabia originally appeared on Autoblog on Sun, 16 Jan 2011 16:14:00 EST. Please see our terms for use of feeds.